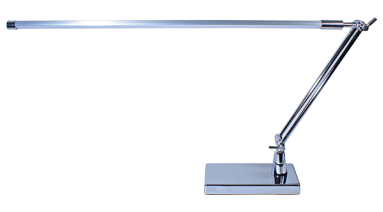 Fully adjustable with a 26" boom arm for wide surface lighting. Full spectrum for reduced eye strain. 12-1/2"H. 7W. Metal and acrylic finish. 535 lumens. Can be used with the weighted base or with the desk clamp (included). 4600K.